manager account is a powerful tool for monitoring and managing multiple accounts. To help save you time and provide more visibility into account performance, we’re introducing a number of exciting enhancements, including cross-account campaign management, powerful reporting tools, and improved account navigation. Creating reports and making quick changes to campaigns across multiple accounts can be incredibly time consuming. To help you manage and report on all of your campaigns at scale, from a single view, we’ve added a new “Campaigns” view to the manager account dashboard. The campaign-level actions you’re familiar with at the individual account level are now available at the manager account level. You can add columns, apply segments, and set filters to report on campaign performance for up to 20 selected accounts. Or, you can take action by quickly updating daily budgets and enabling or pausing your campaigns across those accounts. You can also create a new campaign for any individual account right from your manager account. 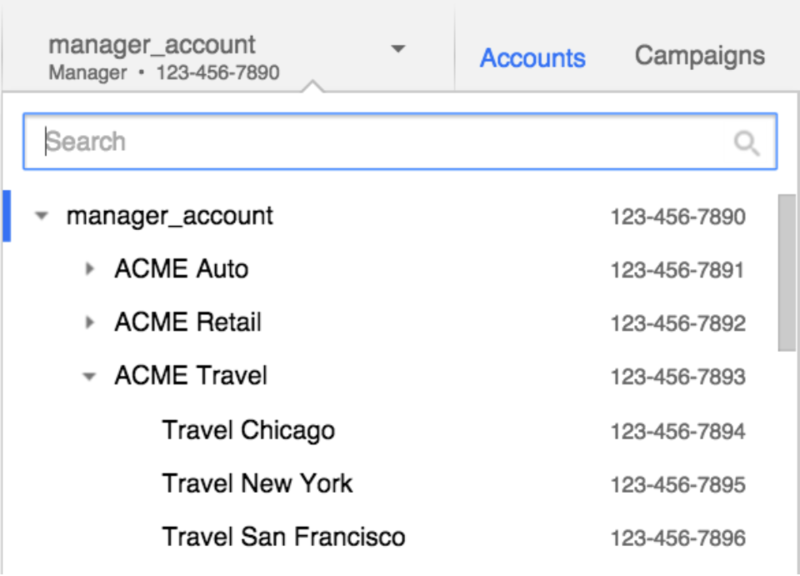 Data freshness in the manager account dashboard now matches the rest of AdWords. This means you no longer have to navigate to individual accounts for the most up-to-date reporting metrics. To make the dashboard reports more useful, you can now select a custom date range beyond the last 90 days, and compare it to any period you want. We’ve also added more reporting columns, including conversions, as well as the ability to chart performance directly in the dashboard. To help you explore your account data in more meaningful ways, we’ve added advanced segmentation and filtering tools. Quickly slice your data based on what matters most to your business, such as by network, click type, or device. Then, apply filters to help identify new opportunities or to simply see the data you’re interested in. If you use sub-manager accounts, there’s also a new dropdown to help you refine your dashboard to only show performance data across directly linked sub-manager and individual accounts, all linked sub-manager and individual accounts, or all linked individual accounts. Finally, we’ve made it easier to find the account you want to view. 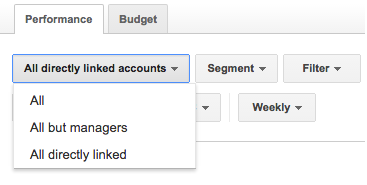 You can now search for or select the manager account or individual account you want to jump to by expanding the dropdown at the top of your AdWords account. Many customers are already seeing early success with these enhancements to manager accounts. 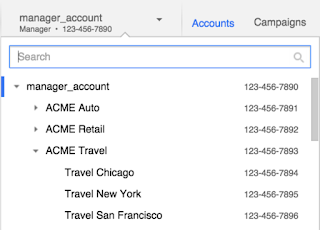 To simplify our naming convention and align with these new enhancements, we’ll no longer use “My Client Center” and “MCC” to refer to AdWords manager accounts. Throughout the year, you’ll see these changes reflected across the AdWords Help Center and in our future communications. 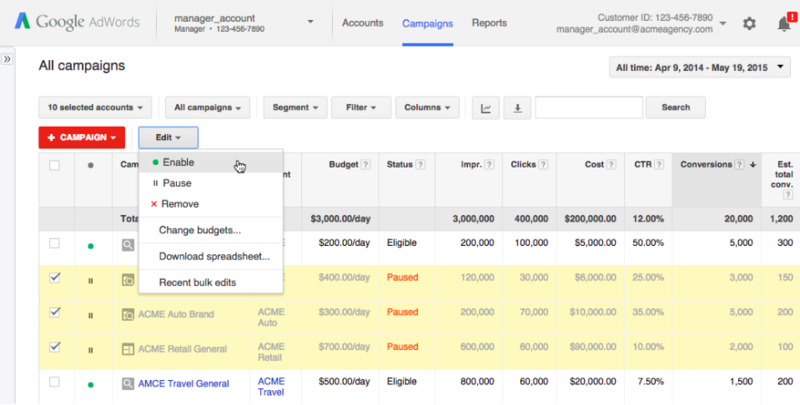 You can take a tour in AdWords of the new enhancements, or learn more about manager accounts in the AdWordsHelp Center. Designed with some of our most sophisticated advertisers in mind, an AdWords manager account is a powerful tool for monitoring and managing multiple accounts. To help save you time and provide more visibility into account performance, we’re introducing a number of exciting enhancements, including cross-account campaign management, powerful reporting tools, and improved account navigation.